Individual child profiles are developed by the educators. Each profile contains a selection of the child's artwork, pictures of different activities, Nippissing Developmental Checklists, individual goals, milestones reached, and observations of the child. We continually update the Nippissing Developmental Checklist, sharing it with families in the fall and spring (at our parent night). Daily communication and information sharing is encouraged to help support the best care. Families are invited to review their child's portfolio as it is a story about their time at Bright Beginnings. 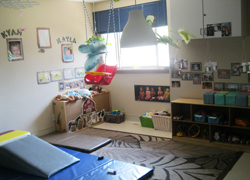 The infant room can have up to 10 children younger than 18 months. There are 3 full-time educators who work with the children, as well as the program supervisor who spends part of her day with the infants ensuring ratios are met and childrens' individual schedules can be followed. Families must complete a feeding chart before care begins. This ensures that the child is only given food that he or she has already tried and the family agrees to. Daily records are sent home which contain eating, sleeping and diapering information. Educators strive to spend as much time as possible sitting on the floor with the children, building a relationship and forming a bond. We understand that because the children are so young, it is important to provide a secure base for the children as they explore their surroundings, try to communicate with others, and learn from their play. Communication is important to share information and news about the child. We strive to build a relationship with the family as well. We understand that you want the best for your child and we are here to work with you. Displays of emergent cirriculum observations are on the wall outside the room. Families are asked to bring in some family pictures for us to display. Once a child is enrolled and starts visiting more information will be provided. We have two toddler groups and can have 10 children in each group. Each group has two educators. The groups combine in the mornings, the end of day, and for outdoor play. The toddlers like to stay active. The educators plan activities to keep their bodies busy as well as their minds! Small group activities are planned as well as projects that can handle the whole group. 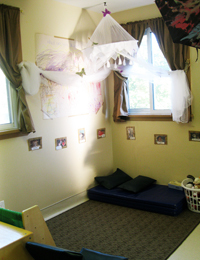 We understand the importance of providing a quiet spot also so the child can have some relaxing moments if they are feeling tired or overwhelmed. Vocabulary is increasing every day and we help this by becoming involved in the play - labeling actions, feelings and objects. Display of emergent curriculum observations are on the wall outside the rooms. Information is provided daily regarding your child's eating, sleeping and diapering routines. This is in addition to the verbal conversations that are so important to exchange information about development and the day's events. Families are asked to bring in family pictures for us to display, as well as a soft sleep toy or blanket if their child wishes. We have two preschool groups. One group can have 16 children with two educators. The other can have 10 children with one educator. The preschool groups are together in the mornings, evenings and outside. Activities are planned using observations of the children including their interests, skills and developmental level. Discussions are also planned to help decide what the children are interested in and would like to learn more about. We believe that children need to learn to co-operate, problem solve, take turns, negotiate, follow directions and get along. We work on these skills along with cognitive developmental skills to promote pre-reading and pre-math skills for school readiness. Children have a rest/quiet time from 12:30-2:30. Children can bring in a favourite blanket or soft sleep toy to have on their cot. At 1:30 children who have not fallen asleep are able to join a Wake-Up Program from 1:30-2:30 in which there are planned activities using observations of their interests, skills and developmental levels. Families are asked to bring in family pictures that we can display on the walls. Parents can communicate daily with the room educators regarding events in the room or how their child is doing. Our food menus follow a five week rotation menu. It follows the guidelines set out by the Canada Food Guide and strives to meet many of the quality assurance guidelines set out in Raising the Bar of Quality Assurance. 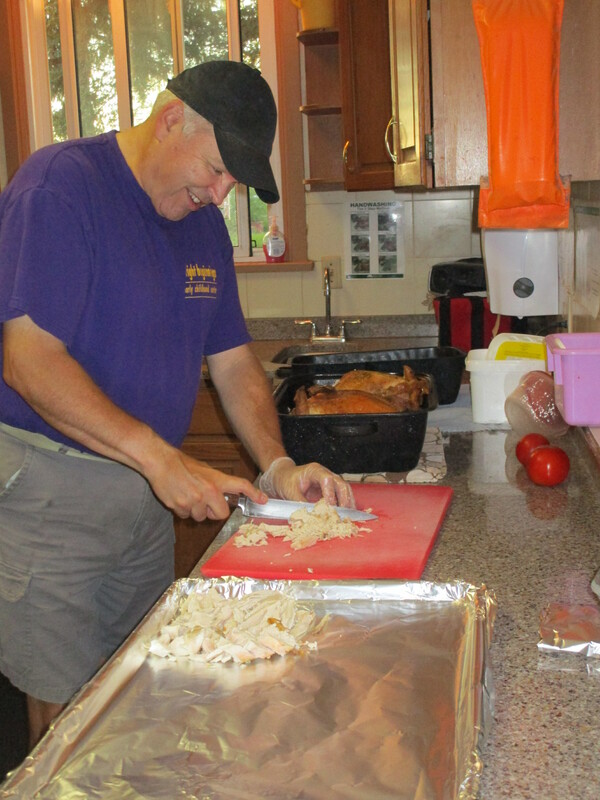 Food is prepared by our cook who holds a valid Food Handlers Certificate. We serve a Morning Snack around 8:30, Lunch around 11:30, and an Afternoon Snack around 2:45. Children who arrive early in the morning can bring in a piece of fresh fruit as a Breakfast if they did not have time to eat at home. 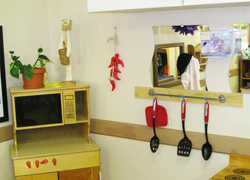 Individual classrooms plan cooking experiences with their groups according to their observations and the interests of the children. We work with families and strive to accomodate allergies and unique dietary needs.